Figure I'd start one since no one has yet. Photoshop users have one so why not Painter users. I don't have any fruit or vegetables painted yet but I'll post when I get some. I think also it could be cool if we can figure out the scripts in Painter and post playback files for other Painter users to share too. 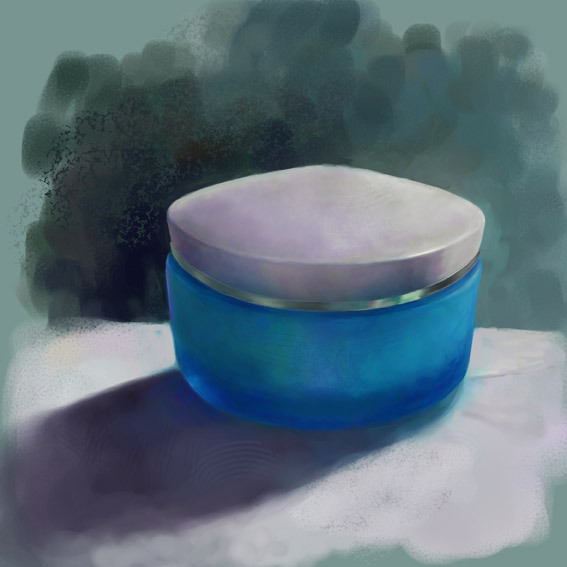 Also I think if someone does a digital painting thread, we can talk about what Brush we used and its method (cover/buildup) so those confused by Painter we can explain how it works. I've messed around with scripting with some degree of success. Hitting the record button before creating the canvas seems to help. And do not color pick on Multiply layers or perhaps on any layer. It seems that it won't choose the right colors when you play it back. For a while I wasn't sure it was recording. Kinda frustrating to paint for a few hours then realize that nothing was saved. cool idea, i'm totally with you guys. just a little up for the start. i used opaque acrylic 10 for that one. Last edited by teho; January 23rd, 2009 at 11:59 AM. i might be interested in this, i use pen - fine point for inking and line art, and the oil pastel 20 for painting, its a great all round brush and you can blend easily without even lifting the pen. I couldn't find any fruit, so I tried this little pot of ointment. This is the first painting I've tried on my new tablet pc. Basically used two brushes. One of Don Seegmillars basic brushes and a modified flat pen brush (plus a few other to add a bit of texture). Not fruit but this is my "ebay" skull I painted on my desk. Artist Oils are my favorite. I used the impasto effect on an overlay layer to give the look of gessoed illustration board. I used: Oil Pastels - Soft Oil Pastel 20 on default settings and it was really hard to paint with hehe... but fun! Here's an apple on my desk. I used Artist's Oils for 95% of the painting. For the texture I used the default variable splatter airbrush then use the Coarse Brush Mover in the Distortion category. I added an anim gif to see the process. Help! Landscape painting, color theory, and digital painting techniques?